The shiny blue of the sea and an immense land rich in fruit trees and vegetable will offer you an amazing sight from here, where the beauty of nature and the quietness of the location blend together giving wonderful time to our guests. Villa Verdura is located in the homonymous Valley, one of the best place in Sicily, not known yet by mass tourism, so that everything is still uncontaminated. Lots of fruit trees, a huge vegetable garden, the river of Verdura and the famous and elegant Rocco Forte's Golf & Spa Resort are few steps away. From the big and comfortable veranda of the house, our guests enjoy an interrupted view of the azure waters, sitting comfortably on the swing or preparing a tasty barbecue. 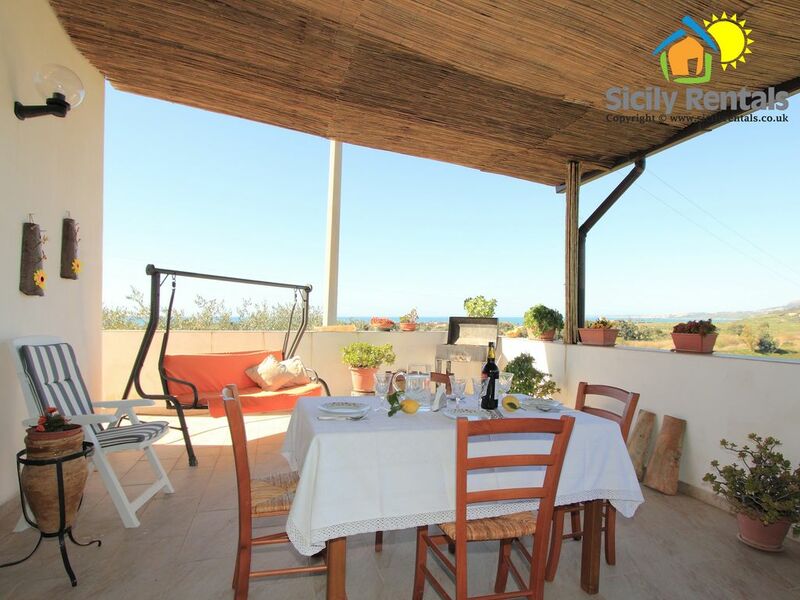 The house accommodates its guests in a wide kitchen-living area furnished with TV and a sofa, which become a comfortable double bed for 2 people; the other 4 accommodations are in a bright double bedroom and in a twin bedroom. Villa Verdura is the right choice for those who want to experience an unforgettable holiday… thanks to the quietness of the area, the beauty of nearby sea paradises, but also the sublime of historical masterpiece, such as the Valley of the Temples! We had amazing time here at this lovely and peaceful farm property. The owners are probably the sweetest and the most kind people you will ever meet, who are also happy to help if needed. There was plenty to do in the nearby cities or ancient villages and we especially enjoyed Torre Salsa beach which is only 30 minutes drive away. Ribera (nearest town) offers plenty of nice restaurants and supermarkets shall you decide to stay in and cook food. If you going to stay here please do ensure you hire a car as it's very remote. Over all we had lovely time in here and are happy to come back any time. La casa è in una posizione isolata in mezzo agli agrumi, con una vista incredibile sul mare e sulla piana verdissima circostante. Il proprietario, Mario, ci ha rapito con la sua gentilezza, la passione per la sua terra e la sua storia. Siamo partiti già sentendo la nostalgia per queste persone vere e per questo angolo ancora incontaminato di Sicilia. Cortesia, accoglienza e senso di libertà ! Posto magnifico, unico, superato solamente dai "padroni" di casa. Accueil chaleureux dans cette maison totalement isolée dans les champs d'oliviers et d'orangers, avec un petit vent de mer qui atténue la chaleur estivale, une vue magnifique sur Caltabellota d'un côté et la mer de l'autre. Pas loin de la petite ville de Sciacca avec quelques restaurants sympas et de plusieurs sites archéologiques intéressant. De belles plages accessibles à 20 minutes de voiture. Un tout petit peu plus d'ustensiles de vaisselle seraient bienvenus pour tester nous même les plats locaux découverts au restaurant. Villa Verdura is characterized by an excellent position and a lovely landscape combined with the quietness of a rural and cosy house not far from some beach paradises. It is located in Ribera, a nice village which rises on a wide hill nearby Agrigento and famous for its international oranges production, so that it is known as “City of oranges” all over Europe. Villa Verdura will offer you this and a lot more. You will experience the emotion of a special vacation combing the typical rustic quietness, magic landscapes, sea and natural paradises but also marvellous cultural routes.